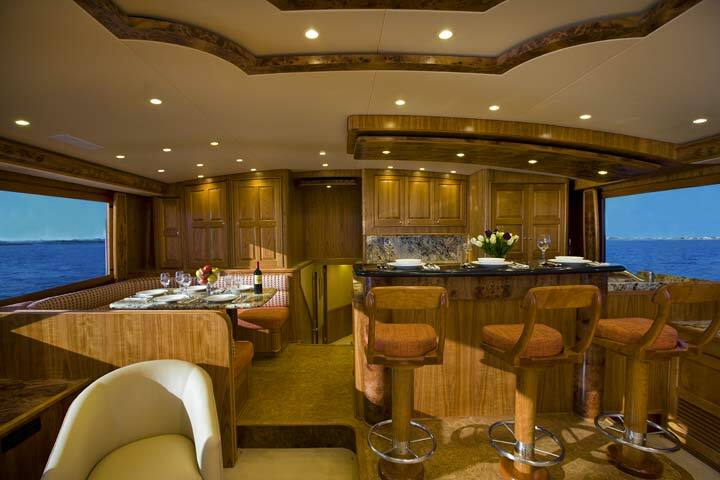 PAUL MANN CUSTOM BOATS OF MANNS HARBOR, NC, was named winner of the Cabinetry category in the Fifth Annual Veneer Tech Craftsman’s Challenge™ woodworking competition for the design and technical skill exhibited in the veneer cabinetry throughout the 76-foot custom sportfishing yacht Ann Warrick. The award was announced at the Las Vegas Hilton during the Association of Woodworking and Furniture Suppliers (AWFS®) Show held in Las Vegas July 15-18. The custom yacht builder was presented a check for $1000 along with a trophy, and the Ann Warrick will be recognized nationwide in print and electronic publications by both the boating and woodworking industries. Judges for the competition were third-party woodworking specialists including world renown craftsman Paul Schurch of Schurch Woodworking, Santa Barbara, CA; Will Sampson, editor-in-chief of CabinetMaker Magazine; and Whitney Coombs, current president of the Architectural Woodwork Institute (AWI). 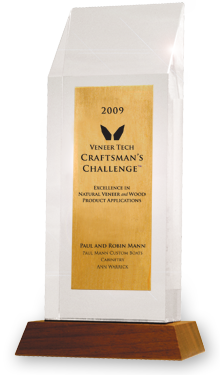 The Veneer Tech Craftsman’s Challenge™ competition aims to recognize excellence in woodwork and architectural woodwork that feature natural veneer and wood product applications. Craftsman’s Challenge& judges reward those who use veneer products in the best way while achieving the project’s stated goals. Paul Mann Custom Boats combines the heritage of true, traditional Carolina design with modern building techniques and materials technology. The style of Mann’s boats has evolved from the basic design tenets Paul Mann learned as he crewed, fished and built boats alongside the forefathers and originators of what is known as the Carolina style sportfisher. Primarily a frame and plank builder, the company now also offers jig-built designs. Paul Mann has been building sportfishing yachts all his adult life and founded his own company in 1988. His team of craftsmen have built over 33 boats to date, ranging from 53 to 81 feet in length overall.